Royal Purple focuses exclusively on developing state-of-the-art lubricants. Its sole mission is to develop products that significantly outperform other synthetic and mineral-based oils. The Royal Purple staff includes formulators that have more than 200 years of combined experience in developing high performance lubricants. These formulators have developed advanced additive technologies, such as Synerlec, which give Royal Purple oil superior film strength, increased viscosity, and improved bonding properties. The end result is improved combustion, better fuel economy, reduced emissions, and less component wear. 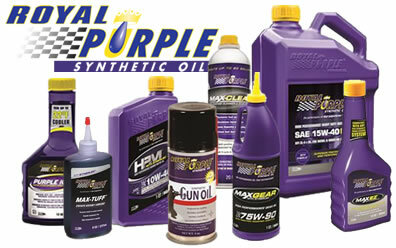 Royal Purple applies these new technologies to its entire line of products including synthetic motor oil, engine break-in oil, transmission fluid, coolant additives, assembly lube, and more.